Got DVD Questions? We've Got Answers! This is the ultimate resource for anyone involved in DVD Authoring! In over 6 hours of tutorials, you will finally have the answers to your most problematic DVD compression and authoring questions. You will learn everything you wanted to know about the DVD specification and how to apply that knowledge to programs you already own. Hosted by DVD veteran and founder of CrazyPants Productions & DVDfyi, Dennis O'Neil, these in-depth tutorials will help you understand even the most abstract concepts related to DVD formats, compression, & authoring. All three discs are packed with useful information on how to make your DVD projects successful. The "DVD Concepts" disc covers the mechanics of DVD in awesome detail backed up by logical graphics to aid in understanding DVD's most abstract topics. All of the intricate settings of TMPGEnc and Procoder are covered in great detail. We also explain the best way to prepare your images and menu assets for the most professional final product. Each of our authoring practicals walk you through the entire process of creating a DVD using your preferred title from Ulead and Sonic. Importing your assets, arranging their playback, creating menus and setting up their behavior, as well as output options are fully explained with useful and insightful hints and tips along the way. You'll finish the tour with a complete understanding of your software and the ability to utilize all of its capabilities. Finishing your project professionally is also discussed. Ever wondered how to make your disc interactive with included PC content? DVDfyi covers it! Ever wondered how to lose that shiny branded surface of your DVD disc? DVDfyi covers it! Ever wondered how you could package your DVD project with Hollywood style packaging? DVDfyi covers it! 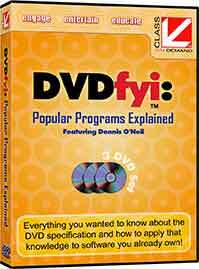 DVDfyi: Popular Programs Explained is THE complete video based reference for DVD authors. No where else can you learn how to create professional DVD's using today most popular authoring and compression software, in addition to fully understanding the underlying technologies that allow the DVD format to exist. Armed with this complete understanding, you'll be sure to walk away a pro! Apply your DVD Specification knowledge to a hands-on lesson in authoring using "DVD Workshop" and "DVD Movie Factory" software. Learn to proof, burn, and package your DVD the professional way. Project files are included on this disc so that you can follow along. Apply your DVD Specification knowledge to a hands-on lesson in authoring using "DVDit! 2.5" and "ReelDVD" software. Learn to proof, burn, and package your DVD the professional way. Project files are included on this disc so that you can follow along.